Tony Fosler (center) holds his son, Elias, as his wife, Amber, looks on. 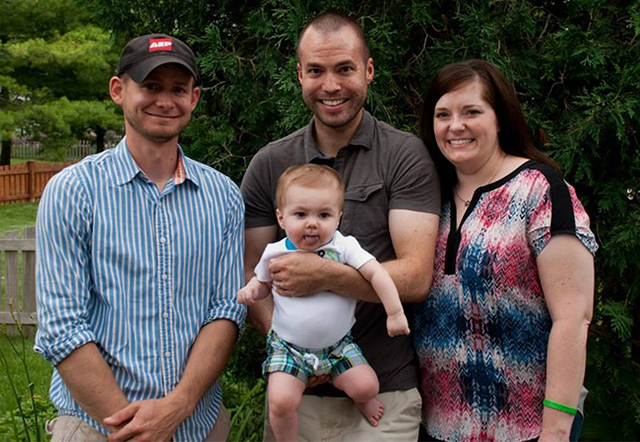 AEP employee Zac Netherton (left), Tony’s cousin, donated part of his liver to Elias. Like many people, Zac Netherton didn’t know it was possible for living people to donate a liver. But when a family member began spreading word that an infant relative needed a liver transplant, Netherton did some research and learned that it was possible to donate part of his liver and it would re-grow, both for the donor and for the recipient. Elias Fosler, son of Netherton’s cousin, Tony Fosler, was born with biliary atresia, a pediatric liver disease, and his conditioned worsened after birth. Time was running out. The Foslers, from Columbus, Ohio, and Netherton traveled to the University of Pittsburgh Medical Center in late February for the operation. Now 15-months old, Elias is very active and doing great, his mom, Amber Fosler, reports.